Ben Kraus and his Bridge Road Brewers team have been pushing the cause of Aussie hops more than any other local brewer for the best part of a decade now, with their Single Hop IPA series just one way in which they've created greater awareness for varieties grown by Hop Products Australia (HPA) in their part of the world (and Tassie). With the HPA lineup altering in recent years, they've had to switch up the hops in the series and have decided to tweak the base recipe for the quartet too, making the malt bill leaner and upping the booze a little. The new face in the crowd is Enigma, coming in for the sadly departed Summer. It's a variety with many facets (OK, so different hops used at different times and in combination with different ingredients do different things, but Enigma seems to possess more chameleonic charms than most...). Typically, you'll hear people talk about berries (we reckon of the light, summery sort) and white wine grapes; as much as that, it's a hop that (synaesthesia hats on, folks) creates an aroma that's broad and creamy in texture and, in the case of this IPA, adds lime curd and bubblegum, maybe even coconut oil, to the mix. The other three have been around before, with Ella a variety that possesses some of Galaxy's tropical fruit character, albeit more restrained, with a softer floral, spicy side too. Indeed, before it warmed up in the glass, there was a lager like quality to the IPA before hints of bergamot and tropical fruits joined in. 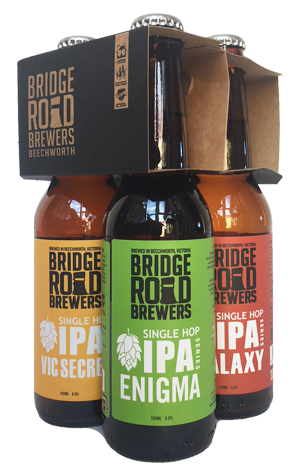 Vic Secret, a variety that was set for the chop from the HPA development program before Bridge Road used it so successfully in its 2011 Harvest Ale, is perhaps the most one-dimensional of the quartet. It's defining characteristic is ripe pineapple, while used in large amounts here it creates overripe fruit flavours too and an almost sticky sweetness wrapped around its piney bitterness. Which brings us to Galaxy, of which there's little left to be said. The star of Australia's modern hop landscape, here it's passionfruit and grapefruit leading the way, with a little grassiness in there too. Taken together, the quartet offers a fun way of educating yourself as well as an insight into the mastery that goes into conjuring the right blends of hops to create great beers.